Reconstruction of the defects created due to wide excision of the lips and oral commissure is always a challenge to reconstruct, particularly if the defect is large and complex. Choice of flap for reconstruction will depend on size and location of the defect. The two main issues that need to be addressed in such a reconstruction are first is oral commissure competence to prevent drooling and second is adequate mouth opening for food intake. The tissue used in the reconstruction of such a large defect should have good vascular reliability; acceptable functional and cosmetic outcomes, and adequate surface area for replacing outer skin cover and inner mucosal lining. Donor-site morbidity should be minimal with good color match. Ideally, free tissue transfer such as radial forearm free flap should be used to reconstruct such a large complex defect, as it will provide adequate amount of tissue needed. However, such a type of reconstruction is not always possible due to patient comorbidities, nonavailability of expertise, and lack of infrastructure, especially in developing country like ours. An alternative to free flap is submental artery island flap (SAIF), introduced by Martin et al. in 1993, as it meets all the criteria for the reconstruction of such a defect in the head and neck region. It is simple to harvest and has minimal donor-site disfigurement. 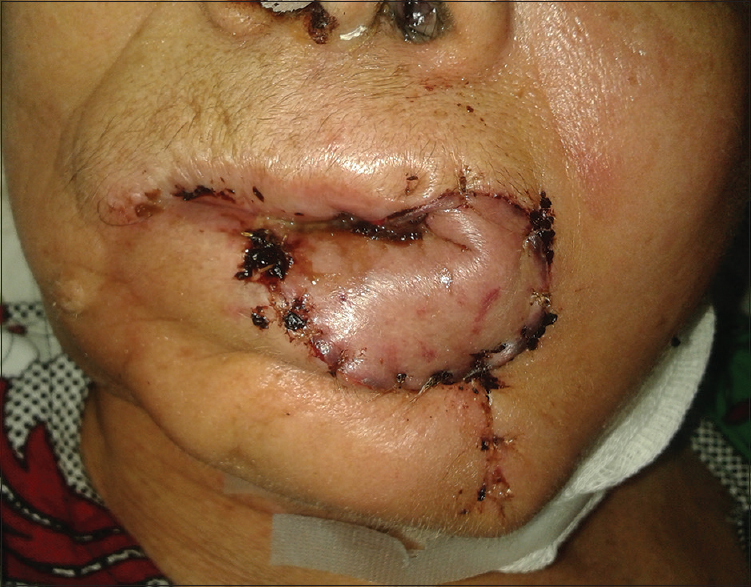 Although the role of SAIF is well documented in the reconstruction of the intraoral defects due to wide resection of cancer, it role in reconstruction of the large lip defects has not be explored much.,,,, We describe the use of the SAIF in the reconstruction of the large defect created due to wide excision of verrucous carcinoma of the angle of the mouth extending to the upper lip and lower lip, inner buccal mucosa, and skin of the mental region [Figure 1]. 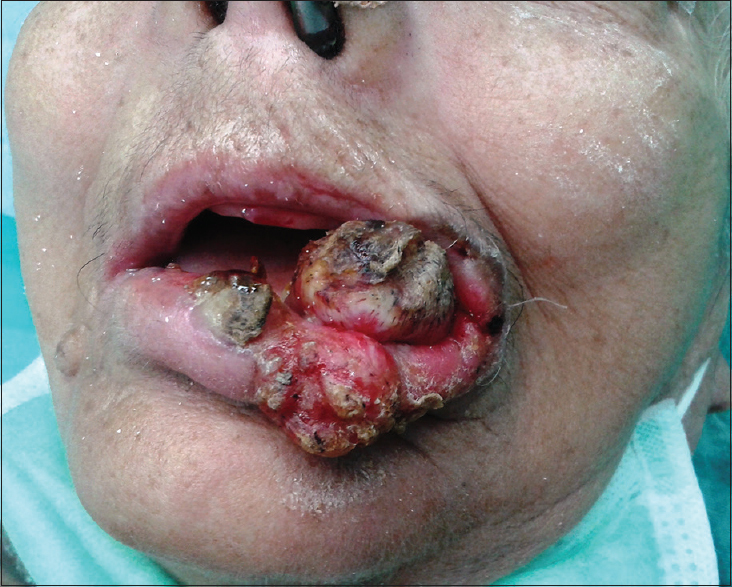 A 70-year-old woman presented to us with verrucous carcinoma of the left angle of mouth with extension to the upper and lower lips, inner buccal mucosa, and outer mental skin [Figure 1]. Detailed metastatic workup did not reveal any metastases in the neck nodes or elsewhere in the body. 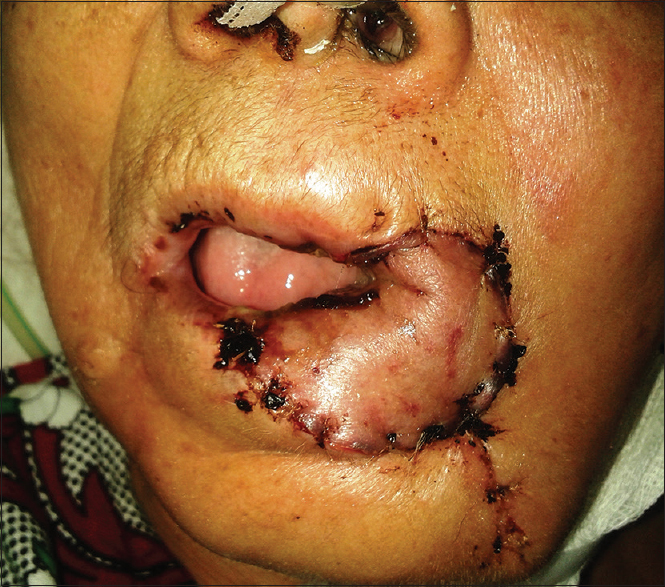 She underwent wide excision of the upper and lower lips along with oral commissure and buccal mucosa as part of curative surgery [Figure 2]. 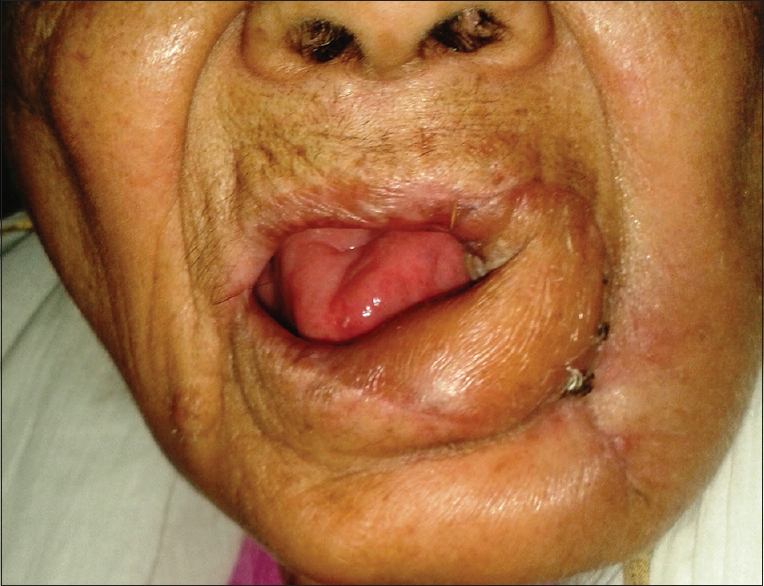 This resulted in large complex defect with loss of upper and lower lips, skin of mental region, mucosal lining of the left cheek along with left oral commissure. We reconstructed the defect by SAIF from the left side with a 13 cm × 5 cm skin paddle. The flap was passed through a subcutaneous paramandibular tunnel on the left side. The flap was placed into the defect with its longitudinal axis corresponding to the anteroposterior direction [Figure 3] and [Figure 4]. The donor site was closed primarily over a suction drain after complete hemostasis was achieved. The postoperative course was uneventful, and the patient's oral feeding was started on postoperative day 4 without any difficulties. 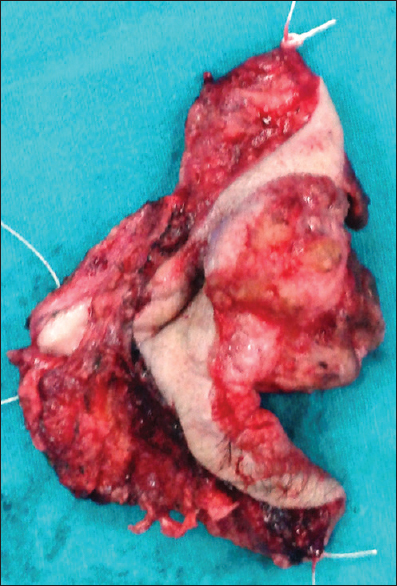 Good cosmetic and functional result was achieved with minimal donor-site morbidity [Figure 5]. SAIF is being increasingly used in the reconstruction of postsurgery defects in the head and neck region. It has become a precious tool for head and neck surgeons as it is simple to harvest and has a short learning curve.,, Our patient had large complex defect of left oral commissure postverrucous carcinoma excision. The size and complexity of the defect demanded a large, well-vascularized thin and pliable tissue for reconstruction in such a critical and dynamic lower face area. Therefore, we chose SAIF to reconstruct this large complex defect as it met all the necessary requirements. There was no need for a staged procedure or sophisticated microsurgical techniques/infrastructure. To the best of our knowledge, use of SAIF in complex lip and oral commissure defects has not been explored much. There is decreased operating time and length of stay in hospital associated with reconstructing defects with SAIF as compared to radial forearm free flap. We were able to perform successful reconstruction with the submental island flap (SIF) with excellent chewing, swallowing, and speech functions, and barely noticeable donor-site scar. The SIF provides thin tissue which is very helpful in reconstruction of defects where both the outer skin cover and inner mucosal lining can be made without adding bulk. We find this feature of the SAIF extremely useful, where bulky flaps may lead to difficulty in oral commissure competence, hence persistent drooling. There has been concern that harvesting this flap can potentially compromise the oncologic clearance as first draining lymph nodes of the oral cancers are Level I nodes. If reconstruction with the SAIF is considered in defects left after resection of oral cancer, neck dissection should be performed carefully after preserving the vascular pedicle. Our case had diagnosis of verrucous carcinoma which is well-differentiated nonmetastasizing variant of oral squamous cell carcinoma. Therefore, we did not resort to neck dissection in our case. The method of harvesting the submental flap is controversial. Some authors are of the view that anterior belly of digastric muscle should be included in the flap. This is based on the basis of their anatomic study, which showed the submental artery ran deep to this muscle in 70% of cadaveric dissections, whereas it ran superficial to the muscle in the remaining 30% dissections. On the other hand, the inclusion of the anterior belly of the digastric muscle has not been deemed to be necessary. We prefer to harvest the anterior belly of the digastric muscle with the flap to prevent possible flap loss. SAIF is an excellent alternative option for the reconstruction of large complex defects of lips and oral commissure. It has a reliable vascular supply and provides a thin and pliable tissue for reconstruction in such critical area of the face. Ease of harvesting and short learning curve are added advantage for head and surgeons. Sebastian P, Thomas S, Varghese BT, Iype EM, Balagopal PG, Mathew PC. The submental island flap for reconstruction of intraoral defects in oral cancer patients. Oral Oncol 2008;44:1014-8. Bertrand B, Foletti JM, Noël W, Duron JB, Bardot J. Submental island flap: A review of the literature. Ann Chir Plast Esthet 2015;60:44-53. Demir Z, Kurtay A, Sahin U, Velidedeoglu H, Celebioglu S. Hair-bearing submental artery island flap for reconstruction of mustache and beard. Plast Reconstr Surg 2003;112:423-9. Genden EM, Buchbinder D, Urken ML. The submental island flap for palatal reconstruction: A novel technique. J Oral Maxillofac Surg 2004;62:387-90.